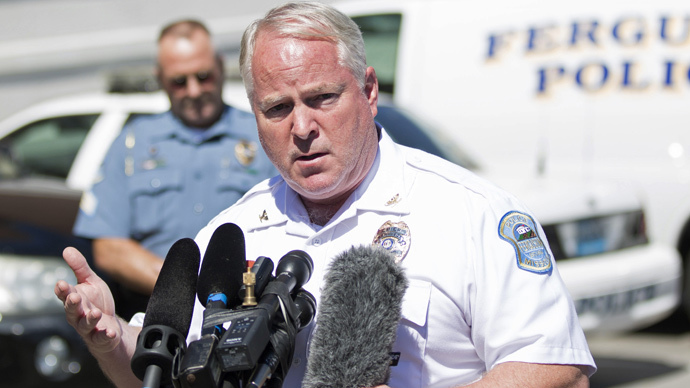 The chief of police in Ferguson, Mo., has resigned in the aftermath of a searing Department of Justice (DoJ) report. The city’s embattled law enforcement agency has been scrutinized since an officer shot an unarmed black teen last summer. “It is with profound sadness that I am announcing I am stepping down from my position as chief of police ,” Tom Jackson said in a statement published first by the St. Louis Post-Dispatch. “My resignation will be effective March 19, 2015 to provide for an orderly transition of command. It has been an honor and a privilege to serve this great city and to serve with all of you. I will continue to assist the city in any way I can in my capacity as private citizen,” Jackson wrote, according to a letter published by the paper on Wednesday afternoon. Meanwhile, the City of Ferguson issued a statement calling Jackson's resignation "a mutual decision," adding that he will receive severance pay for one year as well as health insurance. Once he officially steps down on March 19, Lt. Col. Al Eikhoff will take over as acting police chief. In a press conference, Ferguson Mayor James Knowles III said the severance pay amounts to "roughly $100,000," and that the city will conduct a nationwide search for a new police chief. He said Jackson's decision to resign was made in the best interest of the city. Asked if all the recent resignations are an admission that the Justice Department report was valid and that the problems described in it were real, Knowles reiterated that Jackson's resignation was a mutual decision and officials have not admitted wrongdoing. Asked about the possibility that leadership of the police force would be moved beyond the city's control – Attorney General Eric Holder recently said dismantling the agency is possible, if necessary – Knowles said city is committed to keeping the department under its control. News of Jackson’s resignation surfaced only a day after the Ferguson City Council unanimously agreed to terminate John Shaw from the position of city manager, adding yet another change-up to the St. Louis suburb in the wake of last week’s DoJ report. United States Attorney General Eric Holder said he was “shocked” by the probe’s findings after its release became public, and told reporters that he would be willing to dismantle the city’s police force if necessary. In the aftermath of the report’s publication, at least one member of the Ferguson Police Department was fired and two others resigned. The DoJ report, released on Wednesday last week, was the culmination of a six-month probe spawned by the August 2014 shooting death of Michael Brown, an unarmed African-American teenager who was killed by a member of the Ferguson Police Department, Darren Wilson. “Ferguson’s police and municipal court practices have sown deep mistrust between parts of the community and the police department, undermining law enforcement legitimacy among African Americans in particular,” the investigation determined. Also last week, the Justice Dept. said an investigation into the Brown killing prompted authorities to decline to charge Wilson with any federal civil rights violations. The Aug. 2014 shooting death initially prompted local, then national, protests which were amplified by similar incidents in recent months in which officers of the law were accused of using unnecessary force on African-Americans – especially in cases where the victim is reported to have been injured or killed while unarmed. The City Council of Ferguson voted 7-0 on Tuesday evening to terminate Shaw from the position of city manager, and a nationwide hunt for a replacement is reportedly underway.